The internet search giant has a lot of data on you (and every other user), but it's been hesitant to use it in sending you ads. Until now. There aren't many companies which have anywhere near the amount of data on their users that Alphabet (NASDAQ:GOOG) (NASDAQ:GOOGL) does. But it's also been reluctant to dip too deeply into all those years of Google searches, Gmail messages, Chat messages, Drive documents, and Maps locations in order to build a better advertising business. Worried about chasing away users with privacy concerns, and enjoying terrific growth already, it instead opted for a system that relied on cookies dropped into your browser. That's about to change, and we can probably credit (blame?) Facebook (NASDAQ:FB) for the privacy pivot. Alphabet is rolling out some changes that should allow it to start using a lot more of the data it collects on its users, to target ads much more precisely. This appears to be a response to Facebook's quick rise in the advertising market, especially in mobile, where Google's old ad-targeting tech has been less effective. Alphabet -- which relies on ads for 90% of its overall revenue -- still owns a larger share of the mobile ad market than any other player. But's it's been losing ground in the fast-growing area of advertising, and fairly quickly. The company that's been nipping at its heels is Facebook. Just two years ago, Alphabet claimed a mobile market share twice as large as Facebook's; Facebook has already cut that margin in half. One of the big reasons why the social network is gobbling up an ever-growing share of the mobile ad market is its ability to tap into the data it has on its users and get the right ads to the right people. Seldom does a Facebook quarterly conference call go by without Chief Operating Officer Sheryl Sandberg making some reference to the importance of ad targeting. This most recent quarter, for example, Sandberg said she thinks Facebook compares favorably to any other outlet vying for advertisers' money because it offers a broad reach "plus the ability to target very specifically." It's important to recognize that Alphabet also has a deep trove of data to use to target ads, even if it's been hesitant to use that accumulated data. Some advertisers told Digiday recently that Google has been cautious about how it uses all the user information it's been amassing to target ads, concerned about backlash over privacy concerns. Facebook, on the other hand, has been using user data aggressively in its targeting efforts -- and seeing its revenue mushroom. 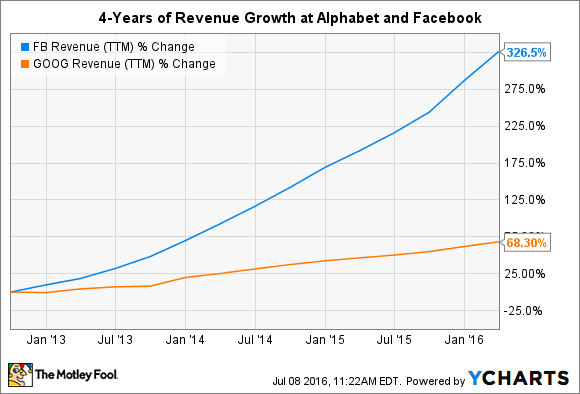 FB Revenue (TTM) data by YCharts. Advertisers told Digiday that the search giant now seems more comfortable rolling out features which use that accumulated data to help target ads, having seen Facebook test the waters and encounter relatively minimal blowback from its 1 billion daily users. But Alphabet still appears to be tiptoeing its way into data-heavy targeting. Its initial efforts will let users make the ultimate decision as to whether they want their information to be used, anonymously, to serve them better ads. Users can see the types of data the company is collecting, and choose to receive more targeted ads based on that information, through a new "My Activity" page accessible through the Alphabet properties they sign into, like Gmail and YouTube. Facebook execs, on the other hand, have asserted for years that its users don't inherently hate advertisements popping up on their screens -- they just hate bad ads. Targeting helps put better ads in front of users, so it ultimately leads to a better experience; rather than drive users away, the ads may help keep them around. It's probably not quite that simple. But Facebook is clearly onto something important, since its average user continues spending more time on its properties with each passing month, even as it continues serving them more ads -- and raking in more ad revenue. Advertisers told Digiday that they expect Alphabet to continue rolling out new features allowing them to better target their ads -- "a precursor of things to come," as one ad exec put it. If that proves true, it has the potential to tilt the digital ad game back in Alphabet's favor, and stem some of the market-share losses it's been experiencing. Investors will want to pay attention to what executives have to say about these ad-targeting efforts in coming quarters. The company's growth will hinge, at least in part, on their success.